In our previous home, we had painted blue cabinets and laminate countertops. We were in a rush to sell our home quickly (we sold our house in less than a week! ), and our kitchen didn’t compare to some of the other neighborhood comps. Both the kitchen backsplash and the new quartz countertops made a huge difference in the kitchen; however, it was the tile backsplash that pulled the whole kitchen together nicely. Accordingly, we were looking to do something similar in our new kitchen. We had already gel stained the kitchen cabinets. We refinished the old oak to a modern-looking walnut with gel stain. The next phrase of our kitchen overhaul was installing tile backsplash. This time around, however, we did not need a contractor. I made sure to watch our previous guy as he was installing the subway tiles in the kitchen, asking a lot of questions and trying to learn everything I could about how to install tile backsplash. Luckily, he was a real sport about it, giving me lots of tips and tricks. And, I learned how to install tile backsplash. A tool that I could now use in our kitchen. Therefore, I was confident I knew how to install backsplash and that I could tackle this kitchen project. Here’s a before and after picture of our kitchen. 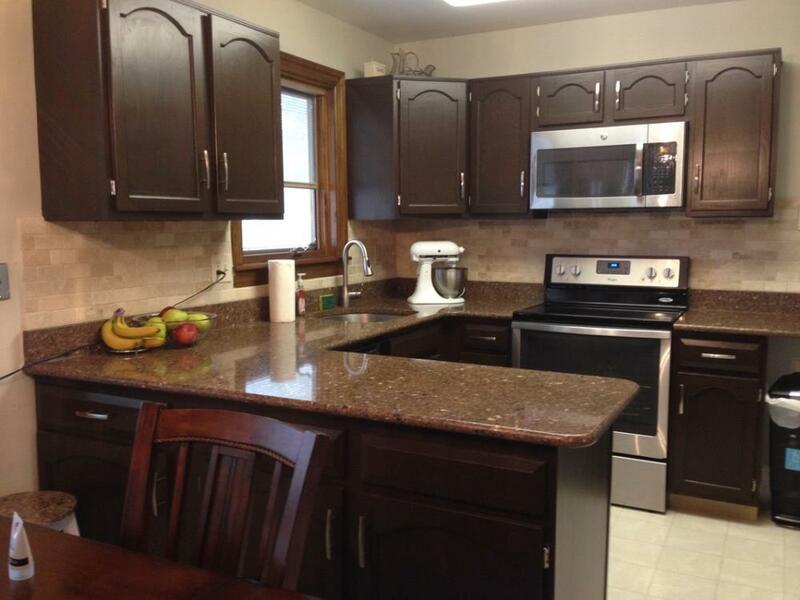 The after picture has the gel stained cabinets and the tile backsplash. Such a big difference, right? The first step of this project was deciding on a tile backsplash. 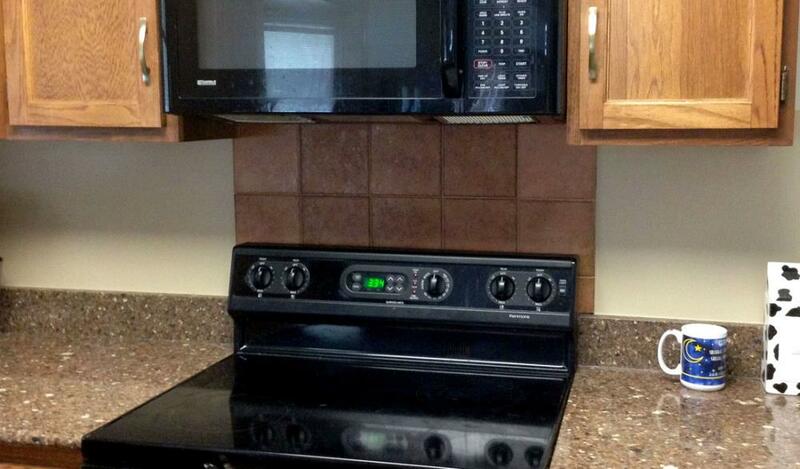 It also couldn’t be too busy of a design because the countertops were already very elaborate. After looking up tiles and prices online, Eileen decided Lowe’s had the best selection of tile backsplash for our kitchen, so she went to the store and took pictures of a few of the ones she liked. Then, I superimposed the sample tiles to create virtual showrooms, so we could visualize our kitchen with each of the choice. 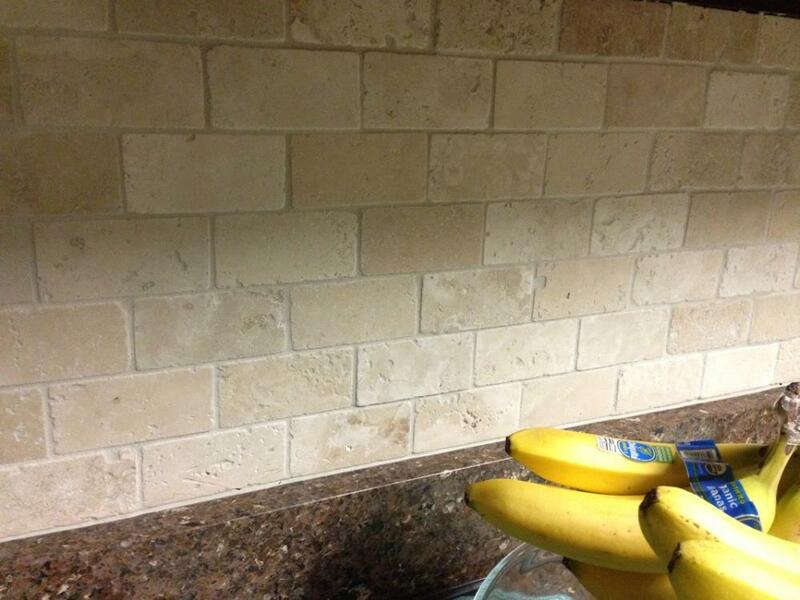 Eventually we settled on a natural stone tile backsplash for the kitchen. Sold on sheets of 15 tiles each, we calculated how many sheets of tile backsplash we would need based on the approximate surface area of the wall. We made sure to pad this number by at least two, to account for any waste factors. The next decision to make was selecting a grout color for the kitchen backsplash. The grout is the filler material that goes in between the tiles. 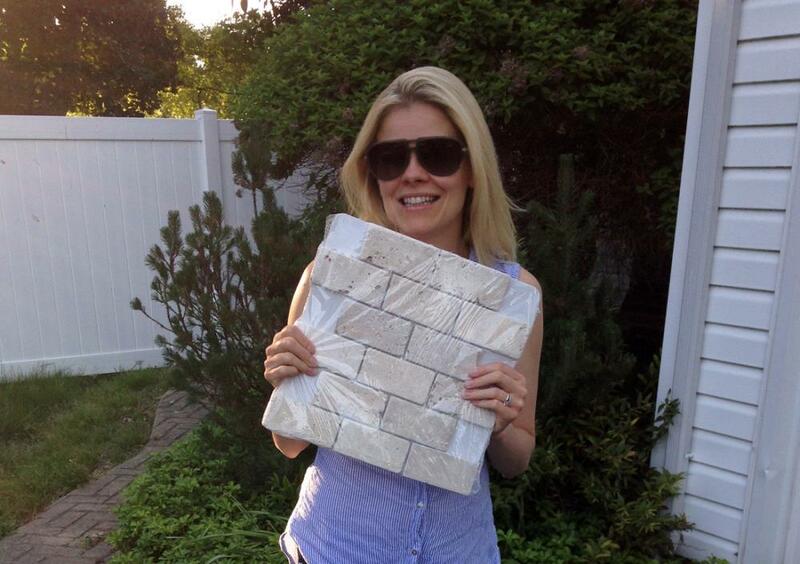 Grout comes in two types – sanded and unsanded. When your tile spacing is less than ⅛”, you need unsanded grout. Our stone tiles used ⅛” spacing, so we needed regular sanded grout. Selecting a grout color was actually the hardest part of the the kitchen tile backsplash project because we kept changing our minds. You don’t realize it but grout plays a big role in a tiled area, as one grout color can completely change the look of the area. Once again we relied on our virtual showrooms of superimposed tiles to guide us on this decision. We initially went with a dark-colored sanded grout, thinking it would match the cabinets; however, we changed our mind when we started using it because it was way too dark once mixed. We ended up going with a grayish colored grout in the end. Next, I needed a way to cut the tiles in order to tile the kitchen. I remembered from discussions with our contractor friend that there were several ways of cutting tiles. Option 1: I could use a hacksaw with a tungsten carbide blade. Although this was the cheapest solution, it seemed like a lot of work. 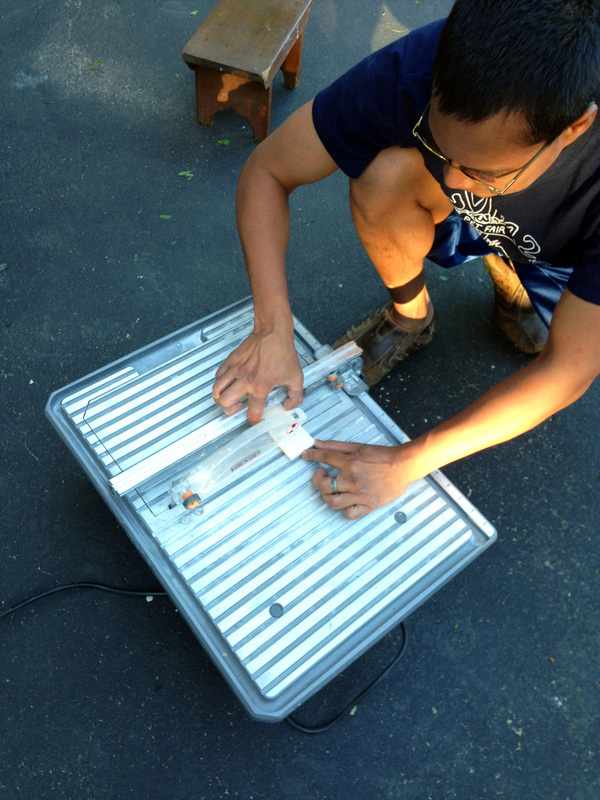 Option 2: I could use a manual tile cutter. It scores and breaks the tile for you. That sounded like a simple option. Option 3: Then, there is a wet tile saw, which is basically a mini-table saw with a water reservoir to keep the blade wet and the tile dust to a minimum. Coincidentally, Home Depot was having a Black Friday sale on wet tile saws, so it was hard to turn down the deal. Admittedly, I would rarely use the saw in the future (how often am I installing tile backsplashes), but it was selling at half price and would greatly expedite progress on this project. 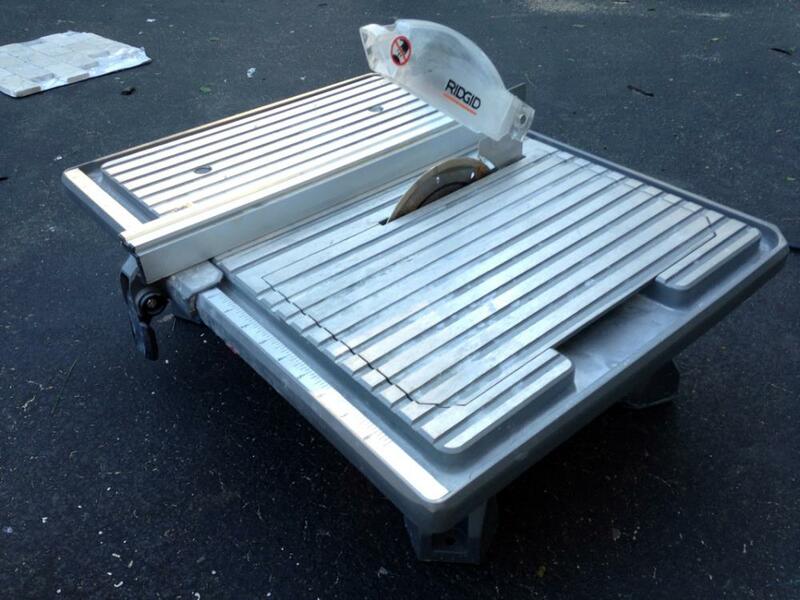 Pictured below is the wet tile saw ready for action. Now, that we had our tile and grout selected (and a brand-new wet tile saw), it was just a matter of preparing the area in the kitchen and getting a mortar mix to bond the tile to the wall. Prior to tiling the kitchen, I removed the small patch of red, pizza-kitchen tiles above the oven (pictured below) with a hammer and chisel. Although they came off fairly easily and quickly, I had to be careful not to cause too much damage to the drywall beneath (the new tiles will need a sturdy and flush surface to adhere to). Then, I prepped the area for the new tile backsplash by removing all the face plates from any electrical outlets/switches and covered the countertop with plastic. We bought a bag of thinset, which is just a quick drying cement used for tiling. It comes in powder form, and you just have to mix it with the right amount of water. The water/powder ratio is the trick to getting good workable thinset. Too much water and the thinset is too runny and the tiles do not stick well to the wall during the drying period. Too little water and the thinset gets too thick and causes difficulties spreading on the wall. So I started with a few scoops of the powder and added in a very small amount of water. I used a paddle mixer attachment for my drill and a large bucket to stir the solution well. My trick to getting the perfect thinset consistency was to slowly add in more and more water until I was comfortable with the result. Once I mixed the right thickness, I let the thinset sit for 15 minutes. This wait time (called slaking) was an important step because it gave the thinset ingredients time to activate. After the slaking period, I gave the mix one more stir, and it was ready to use. It was time to start tiling the kitchen. Using a notched trowel that I purchased specifically for this occasion, I started spreading the thinset onto the drywall. Remembering a tip from my contractor, I worked in small batches. I only put on enough thinset to adhere one sheet of tiles at a time to the wall. To apply the thinset, I scooped some onto a flat (non-notched) side of the trowel and spread it on the wall. Once the thinset was spread evenly over a patch, I switched to the notched side of the trowel. I ran it across the thinset, leaving behind evenly spaced grooves. The grooves are important to help the tiles stick to the wall. I placed a sheet of tiles on the wall and pressed each tile into the thinset. Here is where I made an incorrect assumption about tiling. I thought that because the tiles were already spaced on a sheet, I did not need tile spacers (little plastic wedges that help you keep your tiles evenly spaced). However, once I adhered the sheet to the wall, shortly afterwards some of the tiles started to slide down the kitchen wall. Luckily, I had some plastic washers that were ⅛” thick. I wedged those in between the drooping tiles to maintain the spacing. So, I ran out later that day to get some actual tile spacers for the rest of kitchen tile project. I also had an issue of drooping tiles, especially over areas with no countertop (like across the back of the stove). They just kept sliding downwards. To solve this problem, I put temporary finishing nails below some of the tiles on the bottom row to give them a ledge to rest on. However, the tiles above the countertop drooped too, and I could not have the tiles resting directly on the countertop, as I needed to have a ⅛” spacing. Instead of using finishing nails there, I used some paint stirring sticks, which happened to be the right thickness. 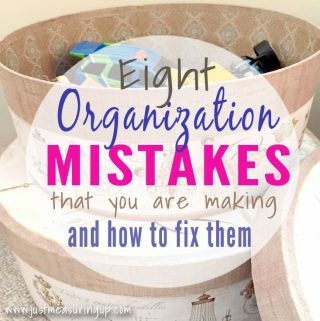 At the time I thought it was a great idea, but what a big mistake it turned out to be. The next day when the thinset was dry, I tried to remove the stirring sticks. They would not budge. They were embedded in the dry thinset, like the tiles above it. I had to use a chisel and a hammer to remove it, and even that did not do a great job. I ended up having to use a special grout removal bit on my Dremel to grind out the wood/mortar mix in the groove between the tile and the countertop. So note for future tile backsplash projects – always use proper plastic spacers rather than improvisation. By now, my newly purchased wet tile saw was really starting to pay off. Just like a table saw, I set the fence on the tile saw to the right distance, and slowly slid the tiles through the blade to cut them, guided by the fence. There was practically no dust in the air, and it was fairly quiet. I could work in the garage at night and not have to worry about disturbing anyone with the noise. Most tiles just required one cut to fit a narrow gap. However, several tiles required two perpendicular cuts, leaving behind an L-shaped tile. These pieces mostly wrapped around an electrical outlet or the corner of a cabinet. To cut these, I held the tile up to where it was going. Then, I penciled in some notches on the surface to remember where to cut it. The only problem I had with the tile saw was where the 2 perpendicular cuts met each other. Since the blade was round, I had difficulty getting the cut lines to fully intersect without over-cutting slightly on one side of the tile (the side facing down on the saw table). I dealt with this by making sure the back surface of the tile faced downward when cutting. The over-cut lines were not visible once the tiles were stuck to the wall. It would have helped to have a tile snipper too. I probably could have eliminated the over-cut problem by getting close enough with the wet tile saw. Then I could have broken off the waste part and then used a tile snipper to clean up the remaining piece. Something to keep in mind for my next tile project, invest in a cheap tile snipper to work alongside the tile saw. I started tiling on the area off-set by the fridge. It was a small area, and when I was happy with that. I continued along the perimeter of the kitchen. I finished installing the tiles in about 2 hours. Eager to start grouting, I had to wait for the mortar to properly set, which meant letting it dry overnight. The next evening, I started the grouting process. I mixed the grout very similar to how I did the thinset. I added the grout powder to the bucket. Then, I slowly added in more and more water (mixing with the paddle) until I got a good consistency. Afterwards, I let the mixture rest for 15 minutes to slake. It was now time to apply the grout. I really just used 3 tools for this process – a grout float, a sponge, and a bucket of water. I used the grout float to scoop the grout out of the bucket, and fill in between the tiles. Also, I made sure not to get any grout into the spacing between the tiles and the countertop. That area actually requires caulking. It would technically look fine if grout was packed in there, but there’s a good chance that grout would crack after some time. I used a sanded caulk that was the same color as the grout. After I packed the grout into the grooves, I let the grout sit for 15 minutes. At this stage, the kitchen wall will look like a big mess, as the grout is wiped all over the tiles. After the setting in period, I used a wet sponge to wipe off all the excess grout. I wiped a few tiles at a time, cleaned the sponge in a bucket of water, and repeated. I saturated the sponge with water, but not enough so that water was dripping down the wall. The wet sponge is what really made the difference. After wiping down the tiles, glimpses of what the final tile backsplash looked like started to reveal itself. Next, I gave the DIY tile backsplash another sponge cleaning 3 hours later. This time though, I completely wrung out the sponge before each wipe, so its just barely damp when wiping the tiles. Also, its important to perform the wipes in one continuous motion, and not backtrack over already wiped tiles. This last cleaning process is important to help reduce the amount of grout haze the next day when everything is completely dry. The next day, I used a dry towel to dust off the tiles and remove any remaining haze. from the grout. With the grout applied to the tiles, I had almost completed the kitchen tile backsplash. Since the natural stone tiles were porous, I waited a few days after grouting and wiped on a tile sealer to help keep water out and protect the stones from daily kitchen use. ​All in all, it took two days to complete the backsplash, and even though I learned a few things the hard way, I successfully installed the tiles in the kitchen. Months later, the DIY tile backsplash looks the same as the day it first went on. It’s amazing how much of a difference the DIY tile backsplash makes. It really ties the whole kitchen together. In learning how to install backsplash, I used new tools and added quite a few skills to my toolkit. It was a fun project to work on. 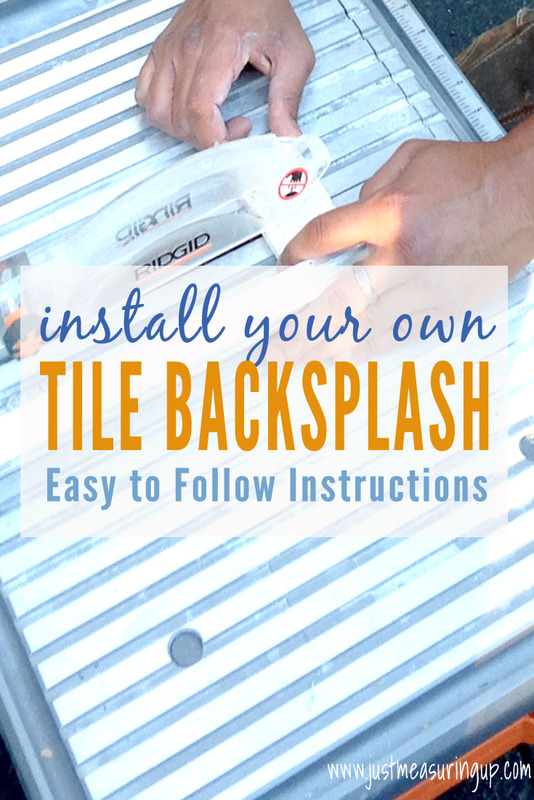 If you are looking to install your own tile backsplash, it’s really quite simple – and it turned out amazing. As for our kitchen, it is slowly coming together. The next phase of the kitchen overhaul is painting the window trim lighter to match the newly modern feel of the kitchen. Then, installing some pendent lighting, and finally converting the desk area to a cabinet. 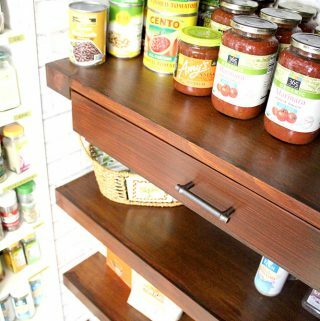 Check back for these projects, or check out our kitchen cabinet post to find out how our kitchen makeover started. Thanks for sharing your tutorial! I am currently painting my kitchen cabinets white and would love to put up a backsplash. A great tutorial Ash. Thankyou! It looks so good. You did a great job! Nice job. Thanks for sharing on the Pleasures of the NW’s DIY link up! Thanks Helen – have a great week! This provided great info! 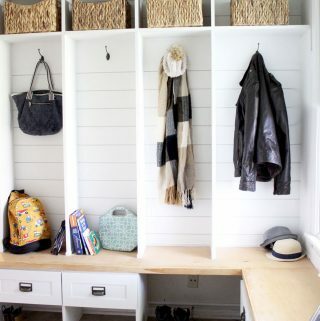 I’ve pinned it to my How To Do Anything Cheaper board on Pinterest. Thanks for the great post. What a transformation!! I’ll definitely be pinning this for future reference. In our last home, we wanted so much to put up a tile backsplash, but being that we knew nothing on tiling, we decided not to even try (for fear of wasting time and money). This was a great, detailed post for those of us who know nothing on the topic. Thanks! You did a fabulous job- it looks so good! The before and after pictures are like night and day! I love the color of the gel stain and great choice on the tiles. It’s very pretty. As I read this it brought back memories of when we renovated out kitchen some years ago. Hubby, rented a wet saw for the tiles from Lowes. I’m pretty sure we still have some tile spacers and thin-set in his workshop. Thank you for sharing with us this week at Celebrate Your Story, have a great week and have a Happy Holiday. Thanks Sandra!! 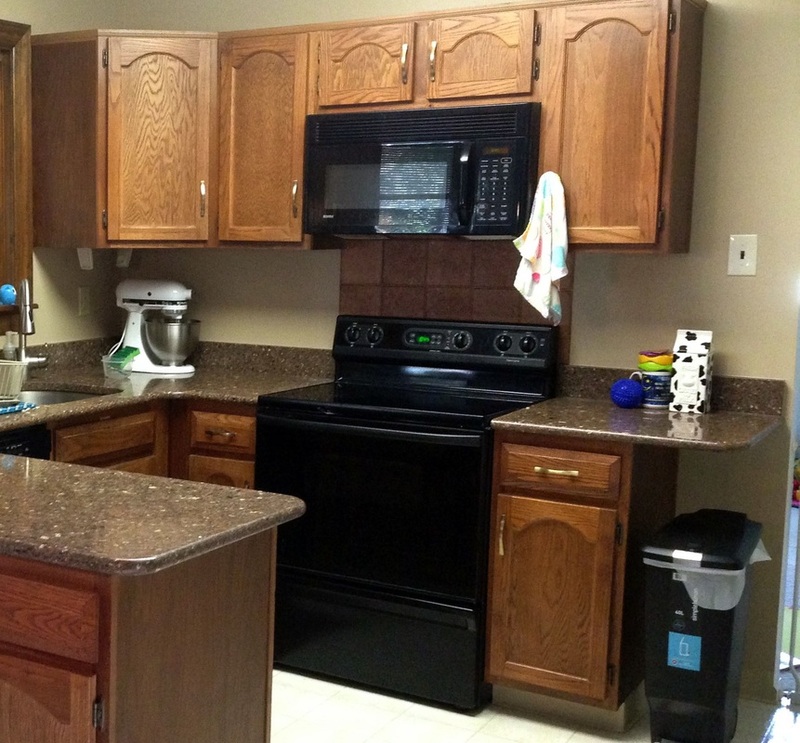 While it isn’t our dream kitchen, it certainly was a HUGE improvement. That’s a great idea to rent a tile saw 🙂 I think Ash always prefers to buy so he can grow his tool collection – but I’ll remind him of the renting option:) Have a lovely week! What a great tutorial! I love how detailed you were with the install – great tips! Thanks for linking up for I DIYed that! Have a wonderful week! 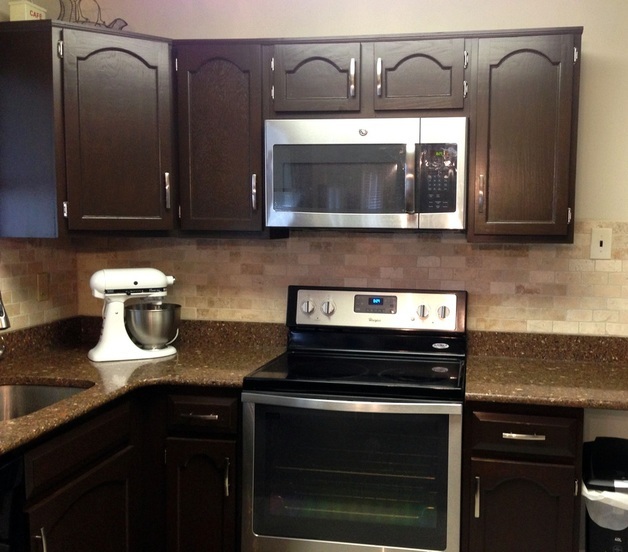 Your backsplash looks great and your cabinets are much improved with that darker get stain. You have done a great job and you have a lot more courage than I do! This looks AMAZING! I learned so much in this post and I am totally bookmarking it because we are in the early stages of planning a kitchen renovation and we want to do a few things ourselves to save money, so this is super helpful! This is so pretty! Tiling is something I have never attempted, but plan on doing in the near future. Thanks for sharing at #iDIYedthat. Pinned! These look GREAT!! My husband installed a backsplash at our last home and it is amazing what a difference it makes to the overall look of the kitchen! Your new backsplash looks great and love the cabinet color too! It looks great! I have been trying to work myself up to try doing our backsplash when we remodel in a couple of months. However, cutting tiles intimidates me. I really appreciate the step-by-step. Thanks, for sharing. Maybe I’ll brave up after all! Your backsplash looks fantastic! It almost makes me feel like trying it myself sometime. Thanks so much for sharing at the #happynowlinkup! Thanks Leslie!! 🙂 You should! It makes such a difference and saves so much money 🙂 Happy Easter!! Wish I had this a week ago! Thanks so much for posting this. 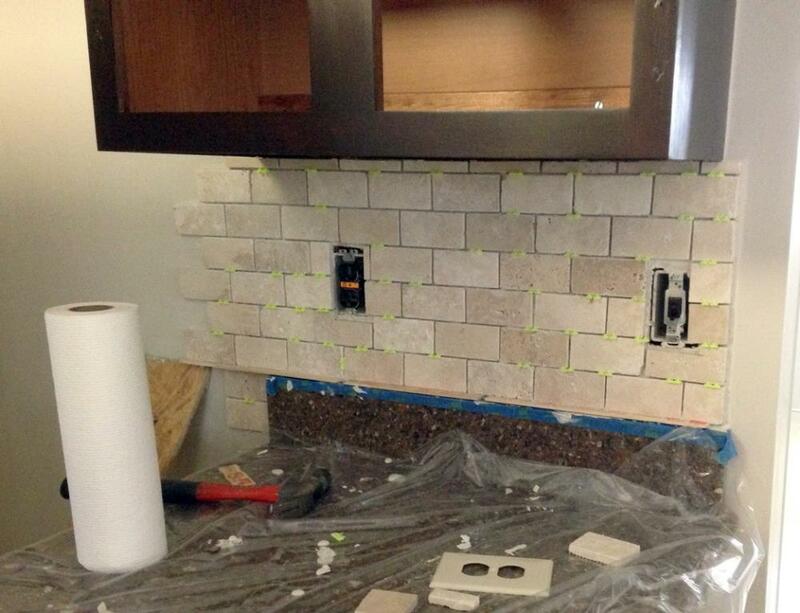 We are thinking of installing a subway time backsplash in our kitchen. Ok what a blessing to see this post. I always wondered how to do this. I am going to save this in Pinterest. You guys did such a great job! It looks fantastic well all of it does. I love the cabinet color too. Looks on point! So happy to find your blog in Bloggers Pit Stop. Following your social media now too! Aww thanks so much, Suzie! It’s a fun project that is thrifty and turns out so nicely. We saved so much by gel staining and adding our own backsplash 🙂 Thanks for the follows :)) Have a wonderful weekend! I loved just how easy you made this project so you’re my choice for this week’s Featured Blogger at the Over the Moon Link Party. Come back between Sunday evening and Thursday evening and grab your Featured Blogger badge and share more posts. Thank you so much, Sandy! So excited to be featured 🙂 Have a lovely week! yes, Stained Cabinet’s look Different & much Better attractive.